Home > Blogs > A Tiznow Sire Line? There was no doubt about Tiznow (TrueNicks,SRO)’s quality as a racehorse. Horse of the Year and champion of his crop at 3, he earned honors a champion older male the following season. He won a quartet of grade I events, and certainly his career highlights were his back-to-back victories in the Breeders’ Cup Classic (gr. I), in which he turned back a pair of formidable European invaders in Giant's Causeway (TrueNicks,SRO) and Sakhee (TrueNicks,SRO) (others behind him in one or both of the renewals including Lemon Drop Kid (TrueNicks,SRO), Fusaichi Pegasus (TrueNicks,SRO), Captain Steve, Albert the Great (TrueNicks), Macho Uno (TrueNicks,SRO), Galileo, Include (TrueNicks,SRO) and Aptitude). What was less certain were his credentials as a stallion. His sire, Cee’s Tizzy, a son of Relaunch, had never won a stakes event, although his brief career did include a third in the Super Derby (gr. I), and was to spend his entire career as a stallion in California. Tiznow’s dam, Cee’s Song, had produced Budroyale, Tiznow’s tough, gelded brother who was a five-time graded stakes winner, but her immediate family was relatively modest, with the first four sires encountered in the tail-female line being Seattle Song, Nice Dancer, Pia Star, and Tompion—not exactly the most influential to stand at stud. Of course, events were to show that within the confines of the Golden State, Cee’s Tizzy was a pretty good sire, eventually getting 39 stakes winners (nine graded), the others including champion older mare Gourmet Girl, grade I winner Cost of Freedom, and graded winners Cee’s Elegance, Theresa’s Tizzy, Lucky J. H. (TrueNicks,SRO), Tiz Elemental, the aforementioned Budroyale, and Tizdubai. Of course, the union between Cee’s Tizzy and Cee’s Song would ultimately produced four stakes winners – Tiznow, Budroyale, Tizdubai, and Tizbud (TrueNicks,SRO) – as well as Tizso (dam of graded winner Tiz West and stakes winner Tizakitty) and Tizamazing (dam of 2011 stakes winner Awesome Patriot). Still, at the time, it appeared very possible that Tiznow might fall into that legion of very good runners with somewhat “off” pedigrees that disappointed as sires (although those looking for a happier precedent would need to look no further than a couple of generations back in Tiznow’s pedigree to Seattle Slew, whose background was considered relatively unimpressive at the time he retired to stud, and whose first yearlings didn’t find tremendous favor either, especially when compared to those of another first year horse, Never Bend’s son J. O. Tobin). Of course, in reality after having become a somewhat surprising leading freshman sire, Tiznow has turned out to be one of our most important sires—particularly of classic distance types—with 37 stakes winners in his first six crops, among them the Dubai World Cup (gr. I) victor Well Armed, champion 2-year-old filly Folklore, Canadian champion older mare Bear Now, and grade I winners Colonel John (TrueNicks,SRO), Tizway (TrueNicks) (a candidate for Eclipse Award honors for 2011), Morning Line (TrueNicks,SRO), Bullsbay (TrueNicks,SRO), Tough Tiz’s Sis, and Da’ Tara. What’s even more interesting is that Tiznow currently appears to have the brightest chance of extending the Man o’ War male line into the 21st century. 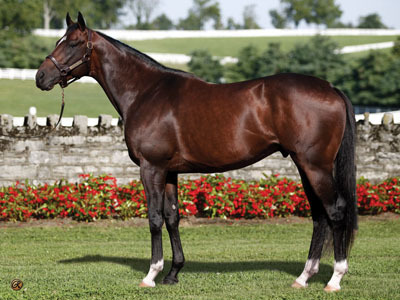 He already has at least 13 sons at stud in the U.S., and six of them are slated to stand at $5,000 or more in 2012. The first of these with runners will be Tiz Wonderful (TrueNicks,SRO) (Spendthrift). A foal of 2004, Tiz Wonderful went into winter quarters as a prime classic prospect having gone three-for-three at 2, with wins in the Iroquois Stakes (gr. III) and Kentucky Jockey Club Stakes (gr. II) in which he accounted for subsequent grade I winners Any Given Saturday (TrueNicks,SRO) and Dominican. Unfortunately, injury prevented him from fulfilling his potential and he raced only twice at 3. Tiz Wonderful is out of a mare by Hennessy, so bred on one of the most prominent crosses for Tiznow, that with Storm Cat and his sons (Storm Cat is a genetic relative to the second dam of Tiznow, and Hennessy has even closer connections with the distaff side of the pedigree). The first crop of Tiz Wonderful yearlings proved popular at the sales, averaging $42,351, with no less than 72 selling. The second major son of Tiznow to retire was Colonel John, who stands alongside his sire at WinStar Farm. Winner of the Real Quiet Stakes and runner-up in the CashCall Futurity (gr. I) at 2, he proved himself among the best of his division at 3 with a trio of stakes wins, including the Santa Anita Derby and Travers Stakes (both gr. I). At 4, he demonstrated his versatility by taking the Wickerr Stakes at a mile on turf in 1:32.2. Out of a mare by Alydar’s son Turkoman (like current leading freshman sire Hard Spun (TrueNicks,SRO), Colonel John has a relatively outcrossed pedigree. The first crop of Colonel John are weanlings of 2011 and were in keen demand, with 10 selling for an average of $105,900, and a top price of $170,000. A pair of Tiznow sons now advertised at $5,000 or more retired to stud last year—Bullsbay to Northview Stallion Station in Maryland and Tizdejavu (TrueNicks,SRO) to Crestwood Farm in Kentucky. Bullsbay, out of the excellent producer The Hess Express (by Lord Carson), has a second dam by Turkoman, so is bred somewhat similarly to Colonel John. He has a graded-winning half sister by a son of Storm Cat, so it looks as if he should be primed for one of Tiznow’s best crosses. Bullsbay hit his peak at 5, when he captured a trio of black type events including the Alysheba Stakes (gr. III) and Whitney Handicap (gr. I), defeating Macho Again, Commentator, and Tizway. Tizdejavu won three graded stakes on the turf at 3, including the American Derby, and was third in the Secretariat Stakes (gr. I). As an older horse he added two more black type events, including the Firecracker Handicap (gr. II) over a mile. There is some precocity in his pedigree, as his dam is a sister to the Sanford Stakes (gr. II) victor Polished Brass. Recently three more major sons of Tiznow have been added to the Kentucky stallion rosters.Tizway, who will stand at Spendthrift Farm, has proved a very progressive sort, and having taken third in the Jockey Club Gold Cup (gr. I) two years ago, and having won the Kelso Handicap (gr. II) by five lengths and finished third in the Metropolitan Handicap (gr. I) last year, he blossomed into an Eclipse Award contender this term. Although he only started four times, they were all in graded stakes, and Tizway was never off the board, ending his career in a blaze of glory by winning one of the fastest ever renewals of the Metropolitan Handicap (gr. I) and then taking the Whitney Invitational Handicap (gr. I) by three lengths. Tizway’s dam, Bethany, is out of the great producer Willamae, whose offspring include Travers and Whitney Handicap (both gr. I) victor Will’s Way, Ashland Stakes (gr. I) victress Willa On the Move, and the very successful regional sire Citidancer. Bethany is by the brilliant sprint champion Dayjur, a Northern Dancer/Mr. Prospector cross, inviting all sorts of recombinations of those two horses. Morning Line (TrueNicks,SRO) is slated to join the ranks at Lane’s End Farm, although for the moment he remains in training. Last year, at 3, Morning Line was first or second in all six of his starts, winning the $1,000,000 Pennsylvania Derby (gr. II), and missing by just a head in the Breeders’ Cup Dirt Mile (gr. I). This term, he added to his laurels with by taking the Carter Handicap (gr. I) in a swift 1:21.46. Morning Line is as well-bred a Tiznow son as you are likely to find at stud, as his dam is by A.P. Indy out of November Snow, a Storm Cat mare whose victories included the Test Stakes (gr. I) and Alabama Stakes (gr. I). The most recently announced son of Tiznow to join the stallion ranks is the handsome American Lion (TrueNicks,SRO), who retires to Darby Dan Farm. At 2, American Lion broke his maiden by nearly seven lengths, running seven furlongs in a fast 1:22.22, and came back to capture the Hollywood Prevue Stakes (gr. III) in 1:22.49. At 3, American Lion ran one of the most impressive Derby trials of the Triple Crown trail, going wire to wire to take the Illinois Derby (gr. III). Unfortunately he suffered a setback after the Kentucky Derby (gr. I) which effectively ended his career. A look at his pedigree reveals that his speed and precocity should have been no surprise, as his dam, Storm Tide, is by Storm Cat out of the Carson City mare City Band, winner of the Golden Rod Stakes (gr. III) and Oak Leaf Stakes (gr. I). American Lion is the first horse for whom Darby Dan Farm have adopted the “Share The Upside” program, pioneered by Spendthrift Farm, and apparently with his outstanding looks, the opportunity to earn a lifetime breeding right in American Lion is being met with considerable enthusiasm by breeders.